By focusing on style and nailing the basics, Fitbit has a winner with the new Alta fitness band. Fitbit’s lineup of activity-tracking bands runs the gamut, from the totally basic $60 Zip to the powerful cardio companion, the $250 Surge. The new Fitbit Alta is a sleeker, more stylish fitness band than the company has attempted before, and with its launch, the wearables market leader has hit the sweet spot. The Alta is a slim, affordable, versatile fitness band that you can take from the gym to the office to after-work drinks without looking like an overzealous weirdo. If that’s important to you, read on. That’s where the Alta comes in. Note: This review is part of our roundup of various Fitbit models. Go there for details on each product and our testing methods. 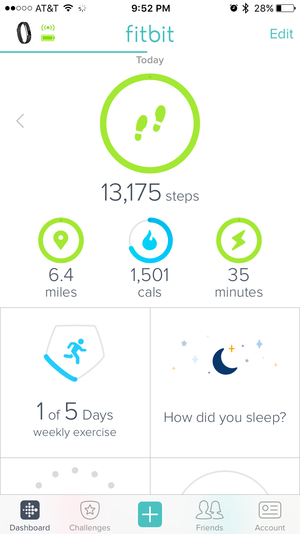 Fitbit's app is a solid dashboard for all your data, plus you can compete against friends and family in weekly challenges. Fitbit put the SmartTrack technology from the Surge and Charge HR in both of its new bands, which means I don’t have to open the app or press a button to begin a workout. The Alta automatically logs my morning miles in the app, no extra work required. The band accurately recognizes walking, running, outdoor biking, elliptical training, and two general categories, sport and aerobic workout (which includes cardio-intensive movement like dancing) and syncs that data to the Fitbit app seamlessly. If you’ve used a Fitbit device before, you’re familiar with the Fitbit app’s ease of use. You’ve also probably set up fitness challenges with your friends and family, which never cease to motivate me. Yes, I’ve walked laps around my kitchen to knock someone else down on the leaderboard, and I’m not ashamed. But let’s get back to what sets the Alta apart from other Fitbits and from most other fitness bands: design. The Alta easily transitions from day to evening with sport, leather, and metal band options. Other Fitbits are just so obvious about their function. The Charge is a utilitarian-looking thick piece of plastic—sorry, elastomer—and the Blaze is even more gigantic. Like those two trackers, the Alta has a display so you can tap to see the time and stats like step count, stairs climbed, and calories burned. But its minimalist look is the best of any Fitbit, and of most Fitbit rivals, too. Like the Apple Watch and Fitbit Blaze, the Alta ups its style quotient with interchangeable bands according to occasion. Workouts require the elastomer sport band, which comes in four colors, then you can quickly switch up to head to work with the leather band, which is available in camel, pink, and a soft grey for $60, or splurge for the $100 metal band. Designer collections are in the works, too. The Alta is one of the best fitness bands around for the average person. If you’re training for a marathon, it’s probably not the best pick, but it’s a solid, well-made device that automatically tracks your workouts, steps, and sleep without any work on your part. The ability to swap out bands according to your mood or the event you’re attending is a plus. Fitbit has finally nailed fitness band design. The Blaze, Surge, and even Charge HR are bulky and look ridiculous on those of us with petite wrists. The Alta looks just as good on my friend’s 6’4“ fiancé as on 5’3” me. That versatility is difficult to come by. How I know the Alta is a winner: Every day I struggle to choose between wearing the new Fitbit and my Apple Watch, which does more than the Alta could ever dream of at its low price point. I guess I could wear them both, but that’s a level of insanity I’m not ready for yet. This story, "Fitbit Alta review: My favorite Fitbit by far" was originally published by Macworld. Fitbit's fashionable fitness band tracks activity and sleep seamlessly, accurately, and affordably.